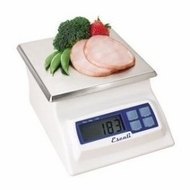 The Alimento digital scale by Escali is equipped with highly accurate durable sensors and features a large capacity which makes it perfect for the home or professional kitchen, office and laboratory use. Some of its many features include a removable stainless steel platform, a large display and easy touch buttons. The Alimento scale is a professional scale for the no-nonsense professional.